You can see growth all around Tuscaloosa. From new apartment buildings to new shopping to new roadwork, it's hard to travel anywhere in town and not notice something changing. Now we have some data to back up what we've all experienced the past five years. 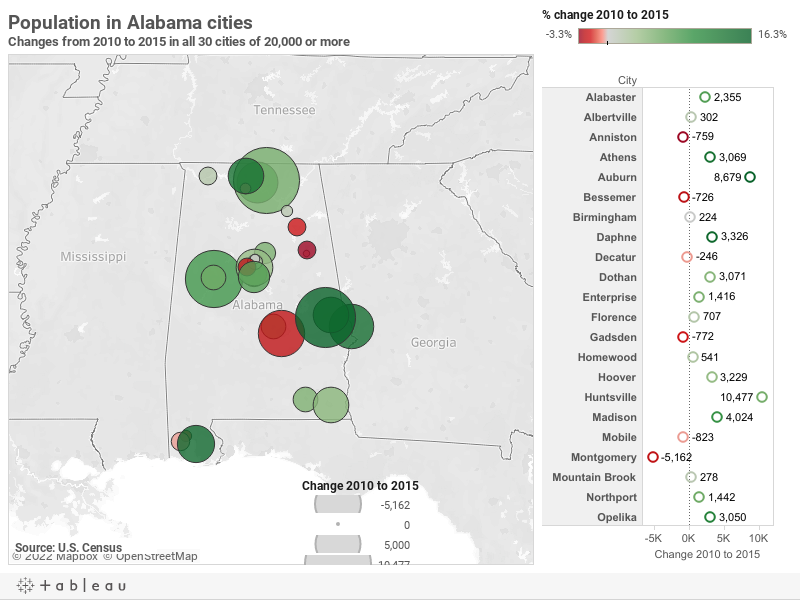 The U.S. Census estimates were released today and they show that the city of Tuscaloosa had a population of 98,332 in 2015, which is an increase of 7,864 people since 2010. The 8.7% change is third-highest in all of Alabama. The only two cities with a higher increase were Auburn (16.3%) and Madison (9.4%). The only two cities with a higher total number of residents added in the past five years were Huntsville (10,477) and Auburn (8,679). Birmingham remained the largest city in the state with a population of 212,461 and the top four remained unchanged, but Huntsville grew while Montgomery and Mobile got smaller. As AL.com points out, if the growth rates continue as they are trending now, Huntsville could become the top city by 2030. It's hard to imagine Tuscaloosa slowing down too much over the next five years as more businesses move to town and the University of Alabama continues to expand enrollment. Do you like the growth in the city or do you prefer the small-town feel?